What you may use today for various health ailments is the same plant oil that Native Americans used for centuries for food and for treating minor abrasions. Evening primrose oil is a popular natural aid for everything from hemorrhoids to bruises and even for a sore throat. We will uncover the most commonly reported evening primrose oil benefits for your health and any possible side effects of the oil. 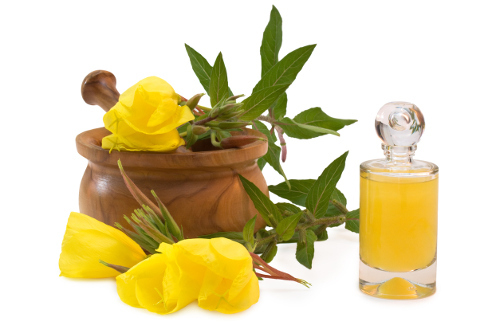 Evening primrose oil is naturally extracted from the plant Oenothera biennis, also known as common evening primrose. It is native to North America and Europe, and accurately reflects its name as it only blooms at night. The oil is drawn from the seeds for the high levels of unsaturated fatty acids, including omega-6 acid, linolenic acid, and gamma-linolenic acid, or GLA. You may recognize the term GLA as the purported natural healing compound for eczema and breast pain. We will next learn about this and other active ingredients of the oil used even today to alleviate body pain and promote blood circulation. As it has been traditionally used to cure headaches, heal wounds, and promote fertility, there is ongoing research to support the theory that evening primrose oil may be the next best thing for preventative care since vitamin C.
Evening primrose oil may promote and maintain good heart health with recommended daily use. This could include preventing heart disease by lowering blood pressure and cholesterol levels. Some use the oil to reduce chances of heart attacks caused by coronary artery disease. Several countries have approved the use of evening primrose oil for treating skin problems such as eczema and atopic dermatitis. The oil’s essential fatty acids are used to treat symptoms and repair skin from such diseases. As diabetics lose the ability to naturally produce sufficient amounts of GLA, evening primrose oil may help to raise those levels. The low GLA amounts may lead to nerve dysfunction such as diabetic neuropathy. This can cause severe pain, numbness, tingling, and loss of motor skills in the fingers and toes. While a GLA deficiency in diabetics can have negative effects, low levels in a healthy body can lead to debilitating diseases such as arthritis. One of the more common uses of evening primrose oil among women is to help alleviate menstrual and menopause symptoms. The GLA may relieve the bloating, irritability, breast pain, water retention, depression, and acne that many suffer during this natural cycle. The natural anti-inflammatory properties of evening primrose oil may target inflammation and settle chest discomfort resulting from various conditions. It may also relieve symptoms of rheumatoid arthritis. In some cases, the combination of evening primrose oil and omega-3 fatty acids has been used to reduce symptoms of ADHD such as distraction, hyperactivity, and impulsive behavior. The muscle aches and pains, concentration loss, and general feeling of exhaustion linked to chronic fatigue syndrome may be alleviated with the use of evening primrose oil. The best results have been found with the combination with fish oil. As evening primrose oil promotes good blood circulation, it may also help to reverse the poor circulation associated with male impotency. The oil has been used in combination with vitamin C and Ginkgo biloba for such issues. Over time, GLA may strengthen the blood vessel to promote blood flow, which in turn may also promote fertility. GLA stimulates the brain to produce prostaglandin E to protect the liver and nervous system. This can help with substance withdrawal symptoms of depression and seizures. With every form of treatment comes the possibility of side effects as every person’s reaction system is different. What works for you may not be the best for another. The basic side effects of evening primrose are rare and include the mild cases of stomach pain, headaches, nausea, and diarrhea. Let’s take a look at other precautions to be mindful of when using evening primrose oil. May lower blood pressure; this can be dangerous if patient is taking blood pressure medication. It is also important to note that the U.S. National Institutes of Health refutes there is sufficient evidence for the use of evening primrose oil to treat certain conditions. Based on information from the Natural Medicines Comprehensive Database, there is research suggesting the oil may be ineffective for asthma, ADHD, liver cancer, breast pain, and psoriasis. The database also claims there is insufficient evidence for treatment of chronic fatigue syndrome, rheumatoid arthritis, acne, and heart disease. So, as always, be sure to consult with your primary doctor or pharmacist before adding this or any other essential oil to your healthcare regimen. What is for certain is that evening primrose oil has been used for centuries as a traditional medicine to treat various conditions, ailments, and diseases. It has the natural components of unsaturated fatty acids including the popular GLA. Evening primrose oil is used for common skin disorders, inflammation, menstrual and menopause symptoms, and to promote good blood circulation. Herbal use for treating conditions is a personal choice and any sensitivity to the plant species must be taken as a precaution. Rogers, J., “10 Health Benefits of Evening Primrose Oil”, Natural Alternative Remedy; http://www.naturalalternativeremedy.com/10-health-benefits-of-evening-primrose-oil/, last accessed May 26, 2017. “Evening Primrose Oil,” Dr. Andrew Weil MD; https://www.drweil.com/vitamins-supplements-herbs/herbs/evening-primrose-oil/, last accessed May 26, 2017.